GUEST BLOG: One day is just not enough to discover Fraser Island... on Day 2 (after time out at the Dingo Bar with fellow travellers) Ranger Les takes the boys to discover some of the top spots on this World Heritage-listed island. After a very good breakfast, hearty and savory for Chris (bacon and beans) and sweet for Marvin (chocolate flakes and honey toast) we were back on the 'rollercoaster' road. We were crossing the island for about an hour to get to Fraser Island's Eastern Beach. Les was driving along the lonely, wide beaches - which are actually a gazetted highway - at approximately 80 kilometre per hour. On the left we saw the island's forests and dunes passing by and on the right we were greeted by a wild and rough ocean – The Coral Sea. There were plenty of shore birds and we were eagerly watching the shoreline to see if we could spot any migrating Humpback Whales. After only a few minutes of Fraser on 75-Mile Beach, we spotted one of the island's most famous inhabitants – a dingo - one of about 200 left on Fraser Island. Today, our first stop on the Eastern Beach side was Eli Creek - a fresh water creek that flows to the ocean. The water there felt even clearer than the crystal clear water of Lake McKenzie and we thought we wouldn't taste water any fresher than that - we were wrong!. We started exploring the creek and surrounds on our own with permission from our guide - during summer this place is jam-packed as it's the perfect place to cool off in the Queensland sun. 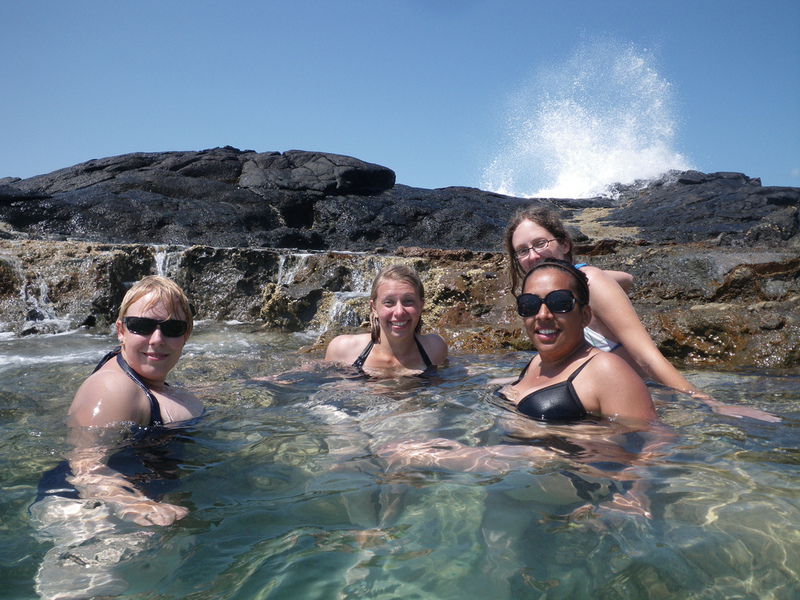 Afterwards we went further to get to Fraser Island's Champagne Pools. They were true to their name, possibly due to the roughness of the sea or the surf on the day we visited. Protected by a rock barrier, the warm foam is created when waves crash into the rock - it's enough for us to believe that we're sitting in a sparkling pool of Champagne. As we had lunch on the rocks enjoying the magnificent view of The Coral Sea we spotted Humpback Whales on the horizon. What a treat! We went further to Indian Heads - a cliff which even today is a very important area for the Butchulla Aborigines of Fraser. Again, this rock formation offers a fantastic view of The Coral Sea. On the way to the top Les explained the local flora and fauna and showed us a wild bush fruit which we have never heard of, with a very nice taste. Afterwards we visited the Red Canyon and were amazed about the many different minerals of Fraser Island's shifting sands. The orange-red colour of the sand is quite unique. The last stop on our tour was possibly the most well known attraction of the island – a stranded shipwreck, called The Maheno. It was awesome. Unbelievable! Very interesting to see how the ocean has taken over the wreck in the last decades. Covered with shells and many colourful crabs it provided an unforgettable view. Before heading back to the Dingo Bar for dinner we stopped at another lookout for a great view, coffee and snacks as well as some more useful tips and information about the natural environment from our tour guide Les. During dinner we said "Goodbye" to Les and headed towards the ferry. As we had some time left we walked along the mudflat whilst the sun was going down. In a nutshell the trip was well worth it however we would definitely recommend staying an extra day and doing the 3 day / 2 night tour. 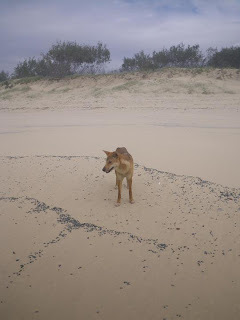 When travelling to Australia do yourself a favour and go on a Fraser Island Cool Dingo Trip. We loved it!